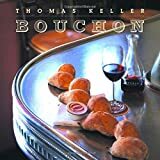 Bouchon, chef Thomas Keller's bistro cookbook, offers 180-plus recipes from his eponymous restaurants--there are two. Readers perusing the near-prosciutto-size book will be dazzled, first, by its great looks (there are many beautiful photos), then, perhaps, wonder why so many of its typically homey bistro dishes are so fussy to prepare. Why, for example, must the onions for onion soup be caramelized for five hours, or the muscles of a leg of lamb separated so that each can be cooked to an exact, presumably optimal, temperature. They should, however, trust this justly celebrated chef, whose sometimes-painstaking refinements reflect a better way. Apart from the excellence of the dishes, the reason to own Bouchon is to discover the richness of Keller's technical understanding. Readers learn, for example, not to baste chicken while it roasts, which creates skin-softening moisture, and to allow the base for crème caramel to sit before baking, thus permitting its flavors to deepen. Keller's sensitivity to ingredients and their composition is profound; and he and his collaborators have presented it so deftly that one finds oneself engrossed again and again. Whether Keller is talking about vinaigrettes (in their balance of fat, acid, and saltines, the perfect sauce) vegetable glazing, or the creation of brown butter, his insights are fascinating.